10-Cup Capacity - Prepare Up To 10 Cups of cooked rice, great for one large meal or to save as leftovers. Automatic Keep Warm - The rice stays ready for serving! The unit automatically switches to the "Keep Warm" function after cooking is complete. Removable Nonstick Bowl - The nonstick cooking bowl is completely removable for easy dishwasher cleanup. Aluminum Steaming Basket - The included aluminum steaming basket lets you make healthy meals with vegetables, fish, and more. 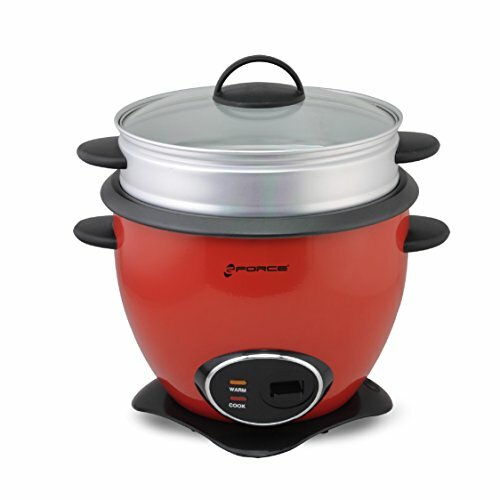 Two Heat Settings - Cooking stops when all moisture is absorbed, then the rice cooker switches to warming mode.